So, Hearts join giant-killers Annan Athletic in the hat for the fifth round of the Scottish Cup, with the draw to be made on Monday at 18:15. Thanks for your company this afternoon. Tune into Sportscene on BBC One Scotland at 22:30 later for highlights of all today's cup ties. We're back tomorrow for Rangers v Cowdenbeath (13:00) and Stranraer v Celtic (15:15) Hope you can join us then. Cheers. "I'm delighted. It was a really good performance and I thought first half, we played really well. In the second half, Aberdeen showed the team they are and put us under a lot of pressure. It was very difficult for us but we managed to hold on at the end. "I thought it was a really entertaining game with both teams going for it." "We played some of our best football in the first half and were a bit slack in the second. We need to take this into the next round and our next league game." 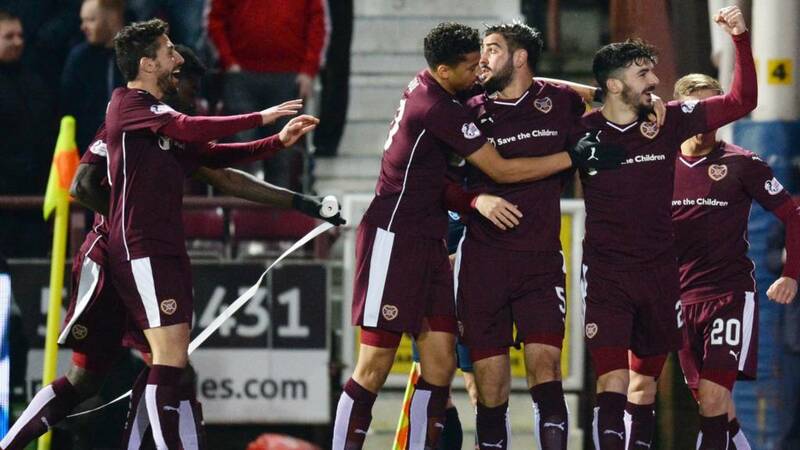 Hearts secure a Scottish Cup victory for the first time since lifting the trophy in 2012. Monkey. Off. Back. Neil Alexander is equal to Ash Taylor's header as Aberdeen pound the Hearts defence in search of a late equaliser. Neil Alexander denies Peter Pawlett with a superb save low to his left and Hearts' slender lead remains intact. Robbie Neilson's side lead courtesy of Callum Paterson's early header. Despite a boat-load of chances for both sides it remains 1-0. Juanma comes on for Gavin Reilly before Hearts keeper Neil Alexander comfortably gathers a tame Kenny McLean free kick. Can the Dons find a late, late equaliser? A howler from Aberdeen's Ash Taylor almost gifts Hearts a second goal. Taylor makes a hash of his leap to head clear, missing the ball and allowing Osman Sow into the box. Aberdeen recover to block the striker's shot. How on earth is this game only 1-0? Another Hearts attack sees Osman Sow free down the left but he drags his effort wide of goal. Gavin Reilly was the nearest team-mate inside the box and would've had a tap in! David Goodwillie is on for Andrew Considine as the Dons bolster their attacking threat in search of an equaliser. Aberdeen should be level. There's no other way to describe it. Jonny Hayes's low cross finds defender Andrew Considine unmarked six yards out. It should be a tap in but his effort comes off his shin and spins over the bar. Adam Rooney displays Ninja-like reflexes to nab the ball from the stuttering Hearts defence but his effort is comfortably gathered by Neil Alexander when he perhaps should've centred for Kenny McLean. Hearts remain ahead in this fascinating Scottish Cup tie with a little over 25 minutes remaining. Sam Nicholson's fierce drive from the edge of the area is deflected wide for yet another Hearts corner - their 10th of the tie - but the hosts can't profit. The flicker of a chance for Aberdeen following good work by Niall McGinn on the left but Kenny McLean blazes high over the bar with a shot that's more likely to take out a supporter's pie & bovril than trouble Neil Alexander. Aberdeen are howling for a penalty as Adam Rooney tumbles under the close attentions of Ozturk as a cross sails into the box. With a shake of the head, referee John Beaton is having none of it. The Dons fans behind Neil Alexander's goal are going bananas! Sam Nicholson dances through a couple of desperate Aberdeen challenges before being felled by Shay Logan. From the free kick, Danny Ward saves well from Ozturk. The Dons have an early chance to pressure the Hearts defence but Neil Alexander comes confidently to claim a ball into the box. Hearts immediately launch a counter attack but the visitors survive.